It feels so good to be back. I know I sound like a broken record, but ladies...it's so true! And it feels even better when I have a fun link-up scheduled with Fancy Ashley! 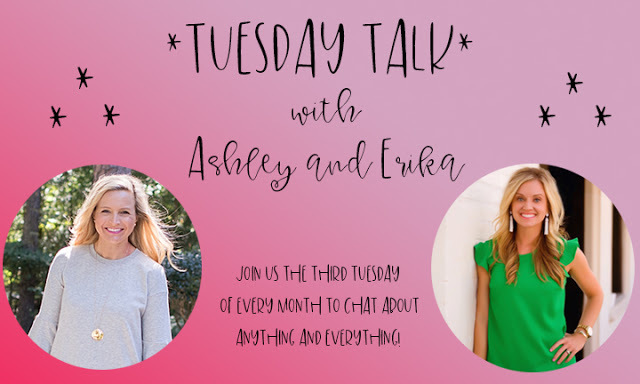 Today is TUESDAY TALK, which means Fancy Ashley and I are chit chatting about anything and everything. We'd love for you to join us! To recap our 2019 so far, in January we re-introduced ourselves for any newbies in the space and then last month I shared a few confessions of things I've "let go". I asked for your "let it go" lists as well. Do you guys remember back in February I got the flu? BLAH! Well spoiler alert-our Spring Break ended with me getting the flu AGAIN! NOT COOL! My mom was quick to point out that I should be doing something to build my immune system. And I thought-who better to ask for ideas, then YOU! Here I am asking for your help! *Should I be taking a special vitamin? I'm about to break out my juicer and start gulping down the celery juice again! I'd seriously love any and all recommendations! And I'm hoping maybe this is helpful for others reading today as well! So glad you're back!....and so sorry you got sick again! :( I used to get to the flu 2-3 times every Winter until this year when I finally started taking a lot of Vitamin C and Vitamin D each day. Like you, I felt like I had 0 immunity--whenever the kiddos brought something home I was the one to get it! Also, we use Oscillococcinum now when any of us start to get the flu. You can buy it on Amazon or Target and it really seems to work! Good luck! For my family and I, Juice Plus has been a game changer! When we do get sick - we bounce back more quickly! Honestly, it sounds too simple, but I really try to get 8 hours of sleep every night! Boohoo for you having the flu. AGAIN! Can't wait to read the comments! Definitely elderberry syrup and up your Vitamin D intake! And the second I start feeling "eh", I start downing oscillococcinum. Hmmm, I recommend a taco lunch with girlfriends with a bowl of queso, just to be safe. ;) just kidding! I’m looking forward to everyone else’s tips, because I am not the best at this! One of the best things I did for my famy’s Immune system was switch all my household products to Melaleuca. I really believe all the harsh chemicals (including laundry detergent) break down our immune system. I am a teacher and I never get sick. My kiddos never get sick either. They were practically the only kids in their school last year who didn’t get the flu when McKinney had that horrible outbreak of the flu last winter. (And no flu vaccines either). Whenever I feel a little tinge of anything, I bulk up on their kids’ chewable vitamins and it knocks it right out. Start teaching again�� Honestly as a teacher I feel my immune system fight off anything! Every day though I do squeeze 1/2 orange and 1/2 lime and a hunk of peeled fresh ginger in my water. #1 because I can’t stand plain water.......#2 it gets better as the day goes on. I also drink pomegranate juice. But I think after 18 year of being enclosed in a classroom 9 months of the year with 9-10 year olds I’m fairly indestructible! I don't really know what your climate is like there, but here it is super dry in the winter. This year we have run our humidifiers (one in each bedroom) every night for at least a couple of hours (they have shut off timers). I have found it has helped immensely and no one has had a real cold all winter. I also have the Immune roller from Saje that I love. I roll it on my neck and chest every night. I'm not sure if it is the magic potion (like I call it), but I think it has helped. We are all taking elderberry gummies everyday at our house thru flu season. So far no flu and that’s with half of our household having immune compromised systems and 2 Kidd in 2 separate schools. Hope you find something that works for you! No one should have the flu twice like that. Hey! We use Elderberry Syrup in our house...there is a woman who lives in Stillwater, MN that makes it herself. People drive for hours to her shop or meet at her at her pop-up shops to stock up on her syrup, you can shop online at www.sailormercy.com. Elderberry! in all forms ;) my kids take the gummies, and I do capsules...consistency is key to build up the immune system...hope you feel better! My magic cure is always sleep; I think it solves everything. I also use YL theives on my feet at night and take an Ally Immune Booster. My husband has an immune system made of steel and laughs at all my "woo woo" attempts to stay healthy. But, at least in my mind, I am giving my self some advantages! ugh, flu is no fun! Hope you find something. For me I know I need more sleep! What I am not getting, but should be! I am all about trying to eat clean, take my vitamins and diffuse all the oils! Everyone in my family takes daily vitamins and we try to get plenty of sleep. Any sign of flu or cold and we start chugging elderberry syrup. But the thing I swear makes the biggest difference is doterra onguard beadlets. They are filled with essential oils. We all take one each day unless we need a boost then we do two. I hope you’re feeling better soon and find something to pump up your immune system! Orange juice, early bedtimes, and hot epsom salt baths! Oh, and plenty of reality TV and magazines too! Doterra essential oils! Especially On Guard on your feet each morning!! Another vote for Juice Plus here! Elderberry - we do gummies and airborne (or generic version) from fall - end of winter/beg of Spring and when we travel! I take a women's multi vitamin every night and a vitamin c every morning and I very rarely get sick. Also, this probably goes without saying, but hand washing and using paper towels to touch public things (door handles, shopping carts, bathroom faucets, etc.) really helps to prevent catching anything that way. We have 14 month old twins that stay at home with my mom while we work, and we are all really good about not touching public things and washing our hands as soon as we come home before touching anyone. Apple cider vinegar! I swear by this stuff. We drink it every morning (1 tbsp in 8 oz of water). Look up all the benefits of it and you'll be amazed. I also use it on my face as a toner (50% water/50% acv). I also take a multi vitamin, probiotic, and calcium chews every day. I've never had the flu nor do I take any Rx meds. I use Elderberry and thieves oil on bottom of feet. Knock on wood the entire family has stayed well! Hope your better! Oh no! I am so sorry to hear you got the flu not once but twice this year! That's awful. Vitamins D & C, probiotics, elderberry syrup and no flu shot! I've been using Elderberry syrup for years and I personally feel like it helps boost my immune system. I cant speak for the flu, but when i double up on the doses when a cold comes on I really feel like it lessens symptoms and shortens the cold. On the other hand, Im pretty conscientious about washing my hands, like maybe too obsessively and keeping them away from my face. Juice Plus is an amazing whole food supplement that I have taken for the last 4 years! It is simply made of fruits and vegetables and the benefits are amazing! I have not had the flu since I started taking it and am rarely even sick with a cold! Elderberry syrup keeps my kids and me healthy and flu free for two years so far. I also take Probio 5 and Biocleanse from Plexus faithfully. I haven't been to a doctor for any kind of sickness in years and I'm convinced it's these supplements along with staying active, regular chiropractic adjustments and getting sleep. I swear by probiotics ! The majority of your immune system is actually in your gut.. if it isn’t healthy, then your immune system suffers. We also take a large dose of vitamin d, zinc and vitamin c regularly . I just try to drink water and sleep eight hours a night. Thanks for hosting and I hope that you have a wonderful week. Juice Plus! My kids and I take them every day and have not been sick in ages! I swear by th Airborne gummies. My husband and I use them daily. Also carry Lysol wipes with you and wipe down surfaces. Hope you rebound fast. This may seem super obvious but changing out your toothbrush after you get over an illness to help prevent another. I hope you are feeling better. I posted the easy elderberry syrup recipe we use and also 7 healing home remedies. I had the flu a few years ago and it was the worst! Prayers for quick healing.